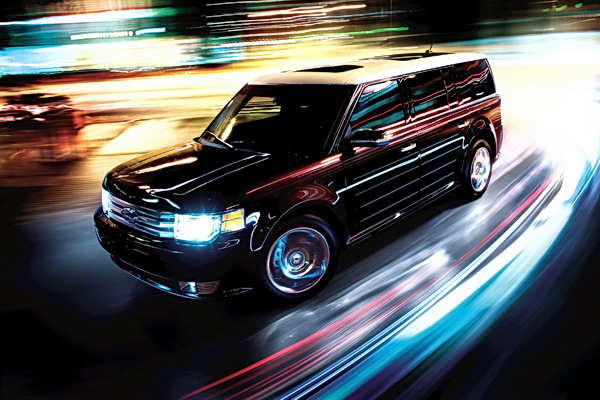 Some in the industry refer to the stylish Ford Flex as a ‘segment buster,’ a vehicle that transcends segment norms. Ford describes the Flex as a crossover/wagon and if you dig deep enough you’ll find that product planners originally intended it to replace the Freestar minivan. Ford bravely offers it without strict definition. It is what it is. Despite its extroverted styling, the Ford Flex share core values with the Forester and is ultimately about practical, accessible room and utility. Use one and it makes sense. Yet as befits the mid-size category and price point, it adds style and with the new 3.5 liter 355 hp EcoBoost engine it delivers real performance. The Flex can be your one everyday car for the full brood and out-perform, out-utility and out-wow its competitors. In the metal it looks thoroughly modern and the styling speaks to all of its virtues. Ford is on a roll and even with slightly disappointing initial sales, CarReview believes the Flex is a good example of the right product at the right time. Repeat after me – “Diesels are powerful, clean, fuel efficient and quiet.” Say it again. Then keep saying it until you actually believe it and would consider buying a diesel as your next vehicle. Say you’re in the market for a new luxury SUV. Why wouldn’t you want one that can get 30 mpg on the freeway and generate over 400 lb. ft of torque to tow 7700 pounds all while emitting less pollution and noise than a gasoline engine? Could it be price? Well, for the luxury SUV I’m referring to in this instance, the 2009 VW Touareg 3.0 TDI, the base price is a scant $42,800 – less than some larger domestic luxury SUVs which have lower towing capacity and half the technological sophistication, handling and refinement. We mentioned the Touareg is luxurious, and because it’s German, it goes without saying that this machine is built like a tank. Doors close with the authority of a Swiss bank vault, the leather seats are firm yet comfortable with commanding, upright position. 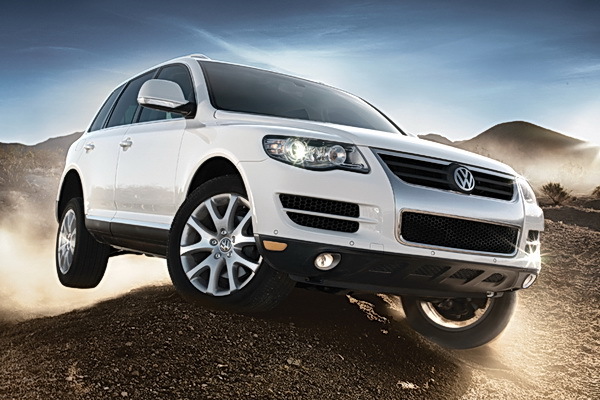 For an all-wheel drive SUV which has available air suspension and exceptional off-road prowess, the Touareg has a terrific ride. It even has surprisingly light and nimble handling like an SUV weighing 1,000 pounds less. Yeah, we know it’s got a HEMI. In a way it’s unfortunate that recent marketing campaigns have sold the Ram on its in-yer-face styling and a big engine at the expense of its other virtues. People forget that the 1994 Ram created a modern truck revolution where attention to cabin details and ride were just as important as towing and payload numbers. Sure, they are tough work trucks, but even back then Chrysler knew that every roughneck appreciates a smooth ride and cup holders on the highway. As in 1994, the 2009 cabin is best in class with thoughtful details surrounding driver and passenger alike. The real revolution is in its suspension. Leaving old-school leaf springs behind, the new Ram uses coil springs in the rear, just as you would find on a crossover. The difference in ride and handling is stunning. Furthermore, its truck hauling/towing/off road ability have not been compromised. It is truly the everyday, everywhere truck for everyone. 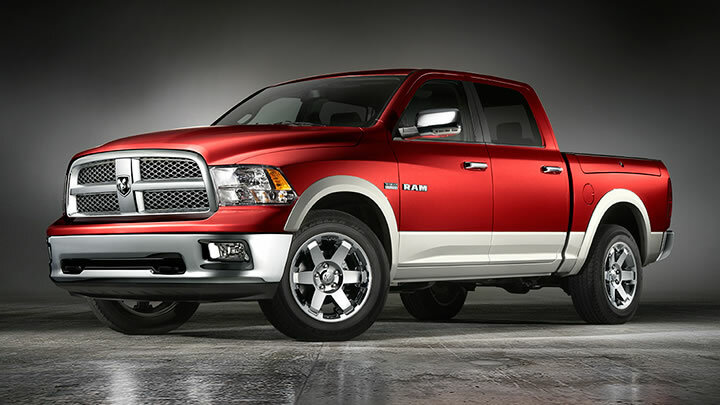 The 2010 Ram receives minor updates given 2009′s full redesign. 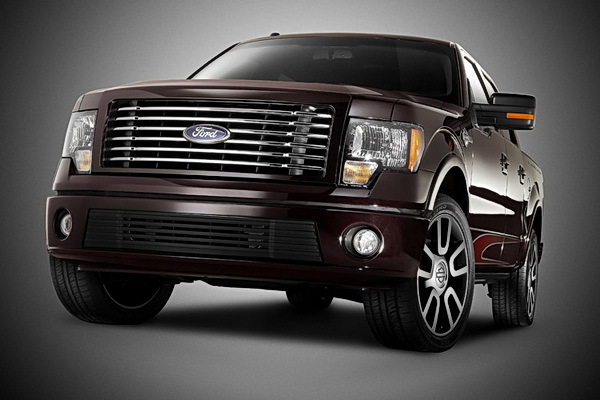 The Ford F-150 is offered in a host of cab, bed, powertrain, and suspension variations. There are three cab configurations with multiple wheelbases and box lengths each, providing choices to satisfy just about any trucker’s need with the F-150. The F-150 is now available in eight trims – nine if you count the new SVT Raptor – ranging from the basic, very affordable XL all the way up to swanky Platinum, King Ranch, and Harley Davidson editions. Since the F-150’s size is a challenge to some, it’s inherited a number of features that were previously only offered on the Super Duty trucks, including an integrated tailgate ladder and box side step. Plus, Ford made some significant packaging improvements with the last redesign; the floor of the rear seating area is now completely flat, and when the rear seats fold up, a huge parcel can be accommodated behind the front seats. 2010 brings improved fuel efficiency to base F-150 models, more safety and tech features available across the line, and a new Ford F-150 SVT Raptor model that promises a complete off-road-honed high-performance package. My vote goes to 2009 Hyundai Santa Fe…it is really awesome car. And i felt it is the best one i ever drive before.thanks for sharing others also. I don’t know why the Auto Press believes they have to include the Accord. It is way past it’s expiration date even though it’s fairly new.First it’s styling is awful somewhat like a BMW 5 series if there designers were mentally challenged. If they would just use Civics design just larger .The materials look so cheap especially in the 4 cylinder format.I would own the Malibu,Fusion,Lacrosse,Mazda6 or Passat over the Accord .Honda really needs to rethink there design .Just look at that awful Element,Ridgeline and the grill on there new Hatchback Accord.How can the company that makes the attractive Civic make these challengers to the Aztec .Funny how the tables are turning recently against the standard barriers .